In Nigeria, the brightly coloured mesh bags locally known as ‘Ghana-Must-Go’ are everywhere. Sold cheaply and durable, there must be at least one in every household, stuffed with clothes or with books; at motor parks, airport terminals and train stations, travellers use them to parcel goods and other cargo intra- and inter-state. But what most might not know is that the rather iconic bag is used across the world and it is known by different names in the countries it is found. This much I found out while viewing the creations of South African photographer Nobukho Nqaba at the LagosPhoto Festival (24 October-27 November). 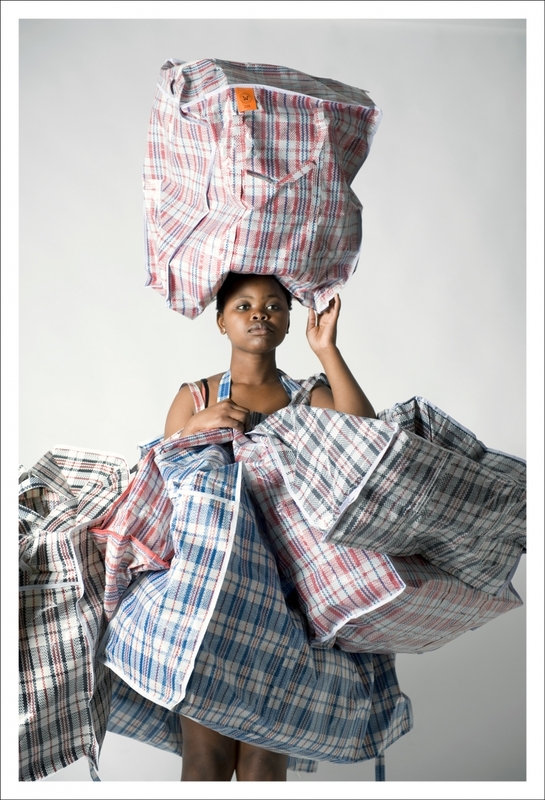 In the Rainbow Nation alone, the bags have five name variants–Unomgcana Umaskhenkethe (Xhosa), China bags, Zimbabwe bags, Khumbulekhaya bags or Mashangaan bags. In the UK they are called Bangladeshi bags; in Germany, Turkish bags; In the US, Mexican bags; and in the Caribbean, Guyanese Samsonite. In these countries, the bags are more objects of derision than anything else, notwithstanding that they serve multitudes. The name “Ghana-Must-Go”–as Nigerians generally call the bags–derives from a not-so-pleasant historical event: when the Military administration in Nigeria instituted a decree in the 1980s that expelled Ghanaians then resident in the country, the longsuffering deportees in their hundreds of thousands packed their belongings in it. “These bags have become global symbols of migration, not only across borders but also within countries,” says the wall descriptions to the exhibits. Spread across a wall some 40 ft long and 15ft high, the exhibition features the mesh material (which are actually produced in China) as backdrop and in photographs in a variety of household decor–as bed and pillow covers, cabinet covers, floor mat, wallpaper, and bedside table covers.